6 Convenio de Desempeño-UTA/Mineduc, Universidad de Tarapacá, Arica, Chile. 7 Departamento de Antropología, Universidad de Tarapacá, Arica, Chile. 9Museo Nacional de Etnografía y Folklore, La Paz, Bolivia. Some human parasites originated in prehominid ancestors in Africa. Nematode species, such as Enterobius vermicularis (pinworm), hookworms and Trichuris trichiura are shared by humans and other close phylogenetic primates (Pan and Gorilla), showing that they infected a common ancestor to this group. When humans migrated from Africa to other continents they carried these parasites wherever climate conditions allowed parasite transmission from host to host. Other parasites, however, were acquired throughout human biological and social evolutive history when new territories were occupied. Paleoparasitology data is a valuable source to recover emergence and disappearance of parasite infections through analysis of archaeological remains. Parasites can be used as biological markers of prehistoric human migrations. They are also indicators of diet, as parasite life cycles are related to specific kinds of food consumed by human groups in the different habitats they occupied. We review paleoparasitological findings in South America, comparing human-host and intestinal parasites with life conditions and environmental relationships through time. Key words: Paleoparasitology, coprolites, mummies, infectious diseases, ancient diseases, parasite-human evolution. Algunos parásitos humanos se originaron en ancestrales prehomínidos de Africa. Especies de nemátodos tales como Enterobius vermicularis y Trichuris trichiura son compartidos por los humanos y otros primates filogenéticamente emparentados (Pan and Gorilla), lo cual indica que tales parásitos antiguamente infectaron a un ancestro común de estos grupos. Cuando los humanos migraron desde Africa a otros continentes, llevaron consigo parásitos a lugares donde las condiciones climáticas permitieran su transmisión de huésped a huésped. Sin embargo, otros parásitos fueron adquiridos a través de la historia evolutiva humana biológica y social, durante la ocupación de nuevos territorios. Las evidencias paleoparasitológicas, encontradas a través del análisis de material arqueológico, son una fuente valiosa para recuperar información de infecciones parasitarias emergentes y desaparecidas. Los parásitos pueden ser usados como marcadores biológicos de migraciones humanas prehistóricas. Además de esto, son indicadores de dieta, debido a que los ciclos de vida parasitarios están relacionados con ciertos alimentos que fueron consumidos por grupos humanos en los diferentes hábitats ocupados. El objetivo de esta revisión bibliográfica es reunir los hallazgos paleoparasitológicos en Sudamérica y comparar la relación huésped humano y parásitos intestinales con condiciones de vida y relaciones ambientales a través del tiempo. Palabras claves: paleoparasitología, coprolitos, momias, enfermedades infecciosas, enfermedades antiguas, evolución parásito-humano. Parasites have been found in ancient remains throughout the world (Bouchet et al. 2003;Gonçalves et al. 2003). Coprolites and latrine contents are the main source of intestinal parasite eggs. Protozoan cysts, however, are not as easy to identify. Nevertheless, serologic techniques have been successfully applied to identify Giardia duodenalis, Giardia intestinalis and Entamoeba histolytica antigens in human coprolites (Gonçalves et al. 2002, 2004; Le Bailly et al. 2008). Other parasites, such as the protozoan Trypanosoma cruzi was recovered from mummified tissues and bone fragments by molecular biology techniques (Aufderheide et al. 2004; Fernandes et al. 2008; Ferreira et al. 2000; Guhl et al. 1999, 2000; Lima et al. 2008). Parasitology is relevant to anthropology and the impact of parasites on human culture can be seen in language, art, religion, biology and archaeology (Araújo et al. 2003). Parasites and parasitic disease have cultural expressions as represented in Moche ceramic art (Heck 2004). The use of regular parasitological techniques, modified and adapted to paleoparasitological research increased and expanded parasite findings to other kinds of archaeological remains (Fugassa et al. 2006; Fugassa, Sardella et al. 2008; Harter et al. 2003; Harter-Lailheugue and Bouchet 2006). Since the first studies in South American human coprolites (Pizzi and Schenone 1954), paleoparasitology has developed as a new research line and this new science appeared based on solid data founded on parasite findings from well-dated and well-identified context, as predicted by Cockburn (1967). Common wisdom about human health conditions and parasite infections in the New World was challenged by paleoparasitological finds. Hookworm (ancylostomids), whipworm (Trichuris trichiura), pinworm (Enterobius vermicularis), and roundworm (Ascaris lumbricoides) were found infecting prehistoric populations both in North and South America. Paleoparasitology focuses on the recovery of parasites from archaeological sites to further elucidate the ancient impacts of parasites on culture. Tracing the origins of parasites is one research thread of importance to paleopathology (Reinhard 1990). Parasitism has a central role in bioarchaeology (Reinhard 2008; Reinhard and Bryant 2008) and has long been recognized as a tool for the archaeologist (Reinhard 1992). As reviewed by Reinhard and Bryant (2008), the relation between cultural development and the nature of parasitism has long been investigated. Reinhard (1988) first formalized this area of research in the Southwestern United States by testing Cockburn's (1971) hypotheses about the impact of agriculture on parasitism. Reinhard showed that zoonotic infections, long standing in ancient populations, nearly disappeared in horticulturalists as humanspecific parasites emerged. Martinson et al. (2003), Reinhard and Buikstra (2003) and Santoro et al. (2003) continued to explore the impact of parasitic disease ecology in the Andes. They clearly defined the role of trade, dress, and water contamination on parasitic disease among the Chiribaya of Peru (Martinson et al. 2003; Reinhard and Buikstra 2003). Santoro et al. (2003) demonstrated that empire development dramatically modified parasite ecology of the Lluta Valley, Chile, during Inka expansion to this lowland territory. Reinhard (1992) noted that the most sensational contribution of paleoparasitology was towards a better understanding of the first human migrations to the New World. In addition, Araújo et al. (1981), Araújo, Reinhard et al. (2008), and Montenegro et al. (2006) stated that human coastal and transoceanic migrations also need consideration because helminth could not survive the colder Beringia climate. Further work by Reinhard and Bryant (2008) introduced the concept of pathoecology, which links parasitism to diet, environmental stress, and other culturally-defined behaviors in the definition of ancient disease. Molecular biology techniques were also applied in diagnosing intestinal parasites. Loreille et al. (2001) and Loreille and Bouchet (2003) discussed the origin and evolution of Ascaris lumbricoides and Ascaris suum parasitism based on DNA studies performed on parasite eggs recovered from mediaeval latrines in Europe. Recently, Leles et al. (2008) applied molecular biology techniques and were able to recover ancient Ascaris lumbricoides DNA sequences from South American samples, negative by microscopy. These findings illustrate the importance of molecular biology techniques in diagnosing parasites in ancient remains. Molecular biology techniques allow the study of genetic evolution of parasites and the timing of their introduction into human populations (Dittmar et al. 2006; Dittmar 2009). By recovering aDNA (ancient DNA) sequences and genotyping parasites from human remains increases the possibility to reconstruct the early dispersion patterns of parasites (Raoult and Drancourt 2008). This paper summarizes the extent of the knowledge of intestinal parasite remains from South America. As such, it familiarizes the reader with the current findings of parasites from this ecologically diverse and culturally complex area. We review intestinal parasite infections in pre-Columbian South America. Paleoparasitological data is used by archaeologists and anthropologists to reconstruct ancient events based on parasite life cycles and biological requirements to maintain transmission from host to host. Climate changes are also associated with the presence of parasite infections in ancient people. For this purpose, paleoparasitological data gathered by the laboratories of Fundação Oswaldo Cruz, Universidad Nacional de Mar del Plata, and Universidad de Tarapacá-Arica, as well as data from other sources published in the literature were reviewed. The goal of this paper is to discuss paleoparasitology results in South America aiming to improve techniques and integrate data obtained by the laboratories involved in this matter. Organic remains were examined by parasitological regular techniques after rehydration using a trisodium phosphate aqueous solution (Na3PO40.5%). According to the nature of the sample, different techniques are recommended. For most coprolite analyses, spontaneous sedimentation in glass jars is recommended (Araújo et al. 1998; Lutz 1919). To prevent bacterial and fungal growth or taphonomic processes that may cause DNA degradation, thus interfering in molecular biology technique that may be applied, all the remaining sediment in the jars should be preserved refrigerated (Pruvost et al. 2007). In some archaeological contexts, coprolites are the main source for paleoparasitology analysis. For example, in northeasthern Brazil coprolites are found dispersed in archaeological layers under rock-shelters or inside caves (Bouchet et al. 2003). Mummified bodies are rarely found in Brazilian archaeological sites. According to Mendonça de Souza (pers. comm. 2008) preservation of the dead was never a common practice among Brazilian indigenous cultures because they believe the soul should be released soon after death. Just after death the individual was cremated, buried, or sometimes the ashes were eaten by others (Chagnon 1983). Paleoparasitological research in Brazil started with an interest in knowing what parasite infections existed before the coming of Europeans and Africans to the Americas (Ferreira et al. 1988). These results were used to trace prehistoric migration routes for the peopling of the continent (Araújo et al. 1981; Araújo, Reinhard et al. 2008; Araújo, Reinhard and Ferreira 2008; Reinhard et al. 2001). Wild animal coprolites were also examined from many archaeological sites, especially focused on parasites of animals that may infect humans (Chame 2003; Sianto et al. 2005). Due to the collaboration with the University of Nebraska, Lincoln, ancient food remains turned to be also a research line at Fundação Oswaldo Cruz (FIOCRUZ). Molecular paleoparasitology has a special laboratory to develop techniques and diagnoses in conditions avoiding modern DNA contamination. The Laboratory of Paleoparasitology at FIOCRUZ, also has an image bank that will soon be available on the Internet. A considerable amount of American paleoparasitological data appeared recently in the literature. Even Southern Patagonian coprolites were collected and examined (Fugassa 2007, 2008; Fugassa, Bayer and Sardella 2008). However as climatic conditions in Patagonia are not conducive to preservation, organic materials are continuously exposed to extreme dryness and cold and sometimes to water percolation. Due to the scarcity of coprolites and other organic material a microscopic method was developed to search for parasites at the Laboratory of Paleoparasitology of the University Nacional de Mar del Plata, Argentina (Fugassa et al. 2006). The method used sediments recovered from the pelvic girdle and proved to be effective; it allowed for recovery of parasite eggs from human sacral foramina stored in museum and scientific institutions (Jones 1982; Fugassa, Denegri et al. 2006; Reinhard 1992). The main reason for pursuing paleoparasitological research in Argentina is to understand the impact of disease during the paleoepidemiological transition caused by the contact of Europeans with Patagonian Aborigins. At the Universidad Nacional Mayor de San Marcos in Lima, Perú, Inés Gárate and her team applied regular parasitological techniques to examine human coprolites excavated in the archaeological site of Caral to search for parasites (Gárate et al. 2005). Caral is the oldest city of the western hemisphere, dated of 5000 years before present (BP) (Solis et al. 2001). Paleoparasitological research started recently exploring this archaeological site material, and first results are expected to be published soon. Paleoparasitology in Peruvian archaeological remains has a tradition in coprolite (Patrucco et al. 1983) and mummy analysis (Fornaciari et al. 1992; Salo et al. 1994), but also on ectoparasites (Rick et al. 2002; Dittmar 2000; Dittmar et al. 2003; Raoult et al. 2008). Another group interested in paleoparasitological research was recently created by Luis Huamán and Hugo Flores, and their students at the Universidad Cayetano Heredia. The main interest of these specialists is plant and food remains and parasite associated with food resources and diet. Regarding the study of parasites in mummified bodies, the Chinchorro mummies of Northern Chile present an interesting challenge. The most ancient mummies were prepared by defleshing the body to the bones and taking out abdominal viscera so intestinal contents are not expected to be found. Desert climate is especially suitable to preserve coprolites and paleoparasites. Fouant et al. (1982) reported a low incidence of parasites in Chilean and Peruvian mummies. Considering the tradition of paleoparasitological research in Chile, the interests varied from tuberculosis and Chagas disease (Rothhammer et al. 1985), intestinal parasites, and diet as well as implications of ENSO phenomenon (Arriaza et al. 2010; Williams et al. 2008). In all the laboratories involved in paleoparasitologial research, ectoparasites have been studied. Mummies of humans and other animals have been searched for lice, fleas, and other arthropods. It is important to look for parasites in the wrapping tissues of the mummies and collect sediment samples near the body. Paleoparasitological research proved that common intestinal parasites infected pre-Columbian people long before European and African migrations (Gonçalves et al. 2003). Data also showed that Amerindians acquired infections by eating intermediate hosts or being in close contact with vectors and hosts of parasites that infect humans (Patrucco et al. 1983; Sianto et al. 2005). Some intestinal parasites that originated in hominid African ancestors were introduced into South America with their human hosts long before European conquest (Araújo, Reinhard, Ferreira et al. 2008). Prehistoric people who lived on the American continent were infected with common bacteria, protozoa, and helminths as in other parts of the world. Although hookworms, pinworm, whipworm, and roundworm infection were the same, prevalence rates among pre-Columbian populations and transmission dynamics should behave in a different way according to the different cultures where they were infecting. Parasite transmission dynamics was not the same in the city of Caral, in Peru, or in the Atacama Desert where the Chinchorros lived, and in the semi-arid region of Brazilian northeast where hunter-gathering strategy was used by pre-historic groups. Thus, generalization on parasites and ecology may lead to erroneous interpretations (Figure 1 and Table 1). Brazilian groups were numerous and lived in crowded villages before the European continent conquest (Heckenberger et al. 2008). Contrary to what is the common knowledge, Amerindian groups living in the Brazilian coast where numerous and just before European conquest some groups were displaced to the interior after tribal wars, and in turn exterminated small groups of hunter-gatherers living in caves and rock-shelters (Medeiros 2002). Figure 1. Map of South America showing the location of paleoparasitological findings listed in Table 1. Mapa de Sudamérica, muestra la localización de los paleoparásitos hallados, citados en la Tabla 1. Table 1. Summary of South American paleoparasitological findings. Resumen de los hallazgos paleoparasitológicos en Sudamérica. Studies about the impact of European contact with indigenous population opened a new line of research, especially regarding paleoepidemiological transition unleashed by European arrival (Guichón et al. 2006). Fugassa, Cicchino et al. (2008) showed that hunter-gatherer groups of Patagonia would have had a parasitological profile, zoonosis caused by close wild animals contact or ingestion of intermediate hosts meat and vegetables contaminated with parasite eggs or cysts, as well as arthropods, such as oribatids, which are intermediate hosts for anoplocephalids. After European contact parasite infections and relative abundance of the common human intestinal worms Ascaris lumbricoides and Trichuris trichiura changed significantly (Fugassa et al. 2006). Crowding indigenous populations in religious missions, reducing mobility of the nomadic groups, and the fast and abundant arrival of domestic animals, mainly sheeps, caused a rapid change of the helminth and protozoan fauna, due to human/animal parasite cross infections. European also caused a reduction of local fauna. Europeans also introduced food storage, attracting rodents and their parasites to dwellings (Guichón et al. 2006). Trichuris trichiura (whipworm) infection was common in South America on both sides of the Andean cordillera (Gonçalves et al. 2003). Whipworm eggs were the first to be found in a South American mummy, together with Entamoeba coli cysts (Pizzi and Schenone 1954). Enterobius vermicularis (pinworm) eggs, curiously, were only found among ancient populations who lived on the Pacific side. Molecular biology studies, however, showed interesting results, with two different pinworm lineages in the Pacific coast populations. One had the same sequences of North American lineages, but the other showed divergent nucleotides in some sequences (Iñiguez et al. 2003). According to the authors, this may be interpreted as the consequence of different origins. While one was introduced by human pre-historic migrations that crossed the Bering Land Bridge more than 20,000 years ago, the other lineage suggests an introduction by another route, in this case supporting transpacific contacts of Asian people in pre-Columbian times (Araújo, Reinhard and Ferreira 2008; Iñiguez et al. 2006). Regarding intestinal protozoan infection, South American paleoparasitology data is not as representative, although the two most prevalent protozoan parasites found in coprolites and sediments were Entamoeba histolytica and Giardia intestinalis (Gonçalves, Araújo et al. 2002; Gonçalves, da Silva et al. 2004). Antigens of Giardia sp., Cryptosporidium sp., Cyclospora sp., and Helicobacter pilori, were identified in Andean mummies dated up to 3,000 years by fluorescent microscopy (Allison et al. 1999; Ortega and Bonavia 2003). As evidenced by paleoparasitology finds, common human intestinal parasites were infecting South American pre-Columbian populations. Although data are still missing for many South American countries, an interesting paleoparasitological picture has been traced from Argentinean, Bolivian, Brazilian, Chilean, and Peruvian archaeological material (Ferreira et al. 2008). When these findings are compared with North American paleoparasitology, a similar picture appears and human strategies to confront different environments can be seen between the continents (Reinhard 1992). 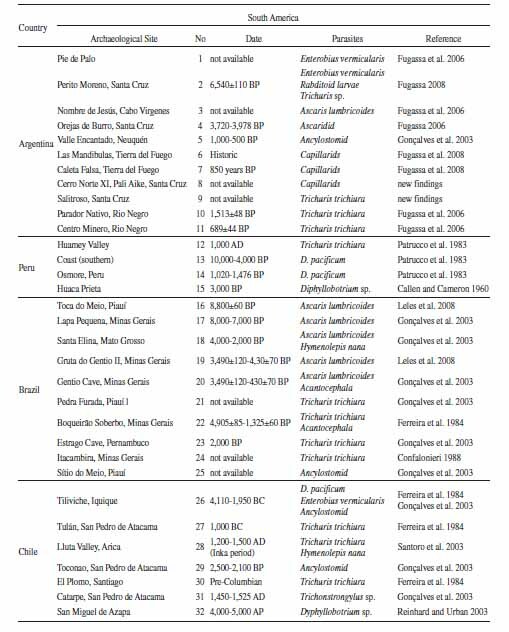 Many of these parasites originated in Old World human populations (Araújo and Ferreira 1995). They came out of Africa with the peopling of Europe. From there, they spread through the world where climate conditions allowed transmission (Araújo, Reinhard and Ferreira 2008). However, humans acquired other parasites from animals whenever humans invaded new habitats, adopted new habits, or created new technologies amplifying their range of influence on the environment. Humans adopted food habits according to the occupied region. This is evidenced by coprolite paleoparasitological analysis. Diphyllobothrium pacificum was a common intestinal infection in the past as it is today in the Pacific coast. The consumption of raw fish is a common habit in many countries and different cultures all over the world. Baer et al. (1967) reported the presence of D. pacificum in modern Peruvian coast population, later D. pacificum infection was confirmed in Peruvian and Chilean pre-Columbian coprolites (Araújo et al. 1983; Ferreira et al. 1984; Patrucco et al. 1983; Reinhard and Urban 2003). Diphyllobothrium pacificum human transmission is due to the consumption of raw fish containing parasites. Echinostoma sp. eggs were found in a Brazilian mummy (Sianto et al. 2005). As this parasite was not recorded in modern South American population, the finding was carefully investigated before publishing this information. It is interesting to note that this case of Echinostoma human infection in pre-historic South America was associated with a case of Chagas disease, with intestinal lesions characterized by megacolon (Fernandes et al. 2008). In this case two important points should be emphasized: firstly, the description of Chagas disease lesions in a mummy outside the Andean region, confirmed by molecular paleoparasitology studies (Fernandes et al. 2008); secondly, an infection by Echinostoma in South American human population not yet described (Sianto et al. 2005). These findings point to the need of further detailed studies at this archaeological site. The presence of animal parasites in human coprolites shows the use of different food resources. However, these habits may still be maintained today by traditional groups. 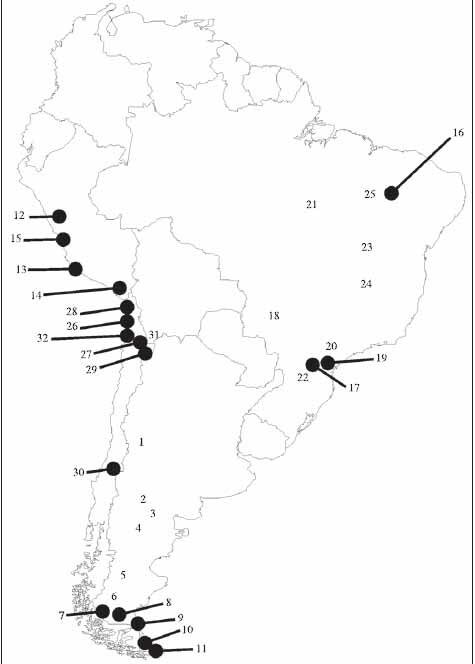 For example, Coimbra Jr. and Mello (1981) found Capillaria eggs in modern Amazonian Indian group, and Fugassa, Bayer and Sardella (2008) identified Capillaria eggs in animal coprolites in Patagonia, which may point to a potential source of infection for humans in this region. Capillaria species rarely infect humans, but eggs can pass with feces when humans eat an infected host. Thus, the eggs can be found in human feces, but disappear after a few days. Fugassa et al. (2006) presented an overview of human and animal intestinal helminths and protozoa found in archaeological material excavated in Patagonia. These findings illustrate the diversity of parasites that can be found in archaeological remains, in close contact with humans beginning 10,000 years ago. Therefore, paleoparasitology is a powerful tool to investigate the variety of food sources used by humans at different times by studying organic remains preserved in archaeological sites. South American mummies provided positive results for ectoparasites. In the fur of mummified guinea pigs (Cavia aperea f. porcellus), numerous well-preserved ectoparasites (lice, fleas, mites) could be recovered (Dittmar 2002; Dittmar et al. 2003). Moreover, paleoparasitological examination of Amerindian clothes provided parasite finds, such as ectoparasites (Fugassa et al. 2007). Molecular biology studies were also performed (Dittmar et al. 2003; Raoult et al. 2008), as well as paleoepidemiological and quantitative attempts to evaluate head lice infection (Reinhard and Buikstra 2003). Head lice were found still attached to hair fragments of a skeleton dated to 10,000 years in northeastern Brazilian (Araújo et al. 2000). Crablouse was also found infecting Peruvian mummies (Rick et al. 2002). Rivera et al. (2008) reviewed the findings of head lice in South American mummies recording new finds of Anthropophthirus capitis (a new genus proposed by Retana-Salazar and Ramirez-Morales 2006 to substitute Pediculus humanus capitis) in mummies of the Chinchorro tradition dated to 4,000 years. This new species proposal is very controversial, but it was proposed due to genetic similitudes found between Pediculus humanus (human body lice) and the Parapediculus (ectoparasite of South American monkeys). To conclude, South American paleoparasitologists, together with North American colleagues, are building an evolving picture of parasite infections dated from the peopling of the Americas (Araújo, Reinhard and Ferreira 2008; Araújo, Reinhard et al. 2008). Paleoparasitological data, through the use of microscopic, immunology and molecular techniques, is an efficient way to provide information about human behavior in the past, contributing to understanding the origin and evolution of infectious diseases and their impact on prehistoric populations. Acknowledgements: Supported by the Brazilain agencies CNPq, CAPES, and FAPERJ. We also want to thanks the Convenio Desempeño UTAMINEDUC for their support and the manuscript editors, and outside reviewers for their comments and suggestions. * Este artículo fue presentado en el Taller de Bioarqueología “Avances y Desafíos del Paleoambiente y la Paleoparasitología”, Arica, noviembre 2008. De 15 ponencias expuestas 7 fueron seleccionadas para ser evaluadas por investigadores externos. Luego fueron editadas por Bernardo Arriaza y Nancy Orellana, en su calidad de editores invitados en este número. Recibido: enero de 2010. Aceptado: noviembre 2010.